A New Publication from the Ozarks Studies Institute, Missouri State University. 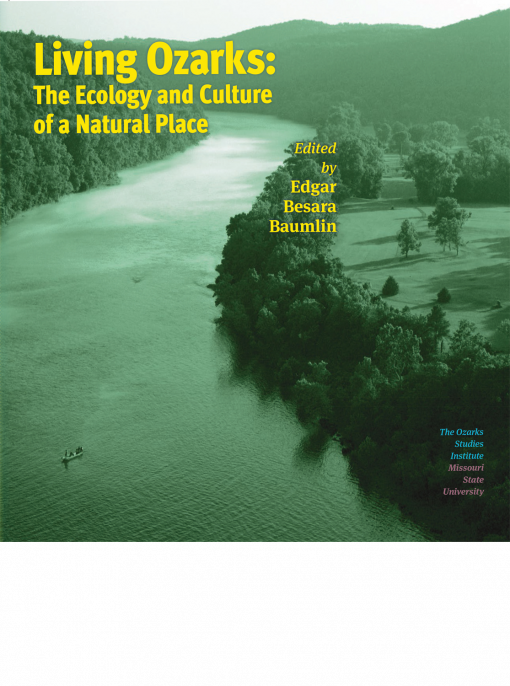 Lavishly illustrated, Living Ozarks: The Ecology and Culture of a Natural Place brings together essays, journal articles, book excerpts, and art/photo albums, all themed around the region’s heritage of nature and culture intertwined. Featured among the artwork are botanical drawings of S. Fred Prince, arguably the Ozarks’ first scientific illustrator; the “outsider art” of S. W. Mannon, one of the last “Shepherd of the Hills” pioneers (whose cabin is now an attraction at Silver Dollar City theme park); and internationally renowned photographer Jacek Fraczak. Readers familiar with the Ozarks’ tradition of nature writing will recognize many of the names anthologized, including Leonard Hall, Milton Rafferty, Robert Flanders, Werner O. Nagel, Robert K. Gilmore, and Dan Saults. Section topics include Defining the Ozarks, Eras of the Ozarks, Sustainability in the Ozarks, The Ozarks as Wilderness, and Experiencing the Ozarks. William B. Edgar is Clinical Associate Professor and Reference Librarian at Missouri State University. Rachel M. Besara is Associate Dean of Libraries and Director of the Ozarks Studies Institute at Missouri State University. James S. Baumlin is Distinguished Professor of English at Missouri State University. Distributed for Moon City Press.